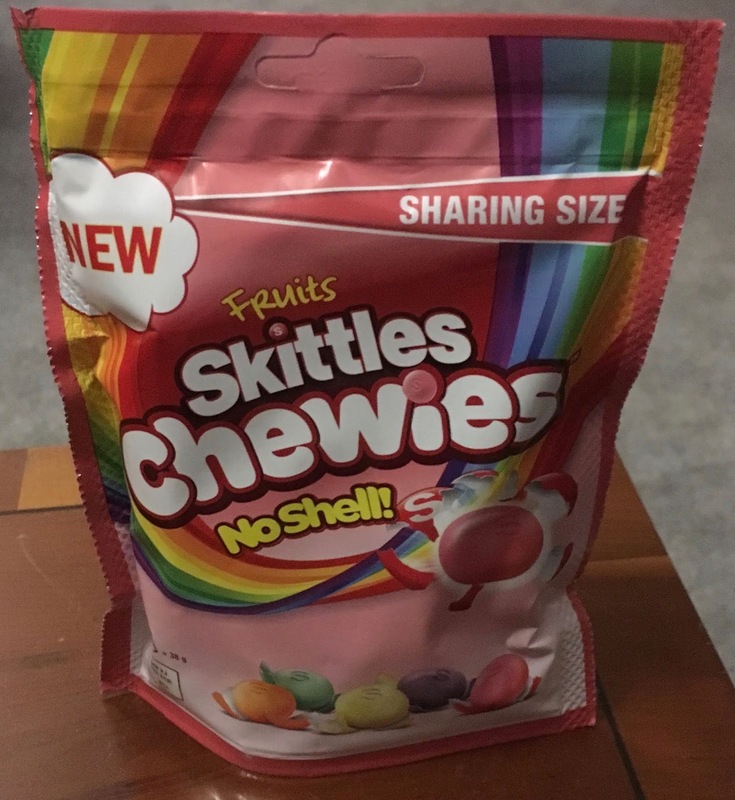 These new Skittles Chewies don't have the traditional shell. In texture they're pretty rough, as funnily enough they have no shell. They seem chewier than usual Skittles would be without their shells, so I'm guessing their production and or ingredients are different. They come in five different flavours. The orange doesn't taste a heck of a lot different than an orange Skittle, asides the missing shell of course. The yellow lemons seemed chewier than the orange for some reason and had quite a sour note at the end of their flavour. The green limes had a mild lime flavour, and not very sour. The pink strawberries had a decent sweet strawberry flavour and were the easiest to chew so far. As usual the purple blackcurrants were the sweetest and tastiest of these Skittles Chewies, but were also the only Chewies to get stuck in my teeth. I found the texture of these Chewies a little odd, especially from flavour to flavour. I guess also odd because I'm used to Skittles with shells rather than without, but I like the crunch and chew rather than just the chew. Part of me wants to say; "If it ain't broke, don't fix it!" 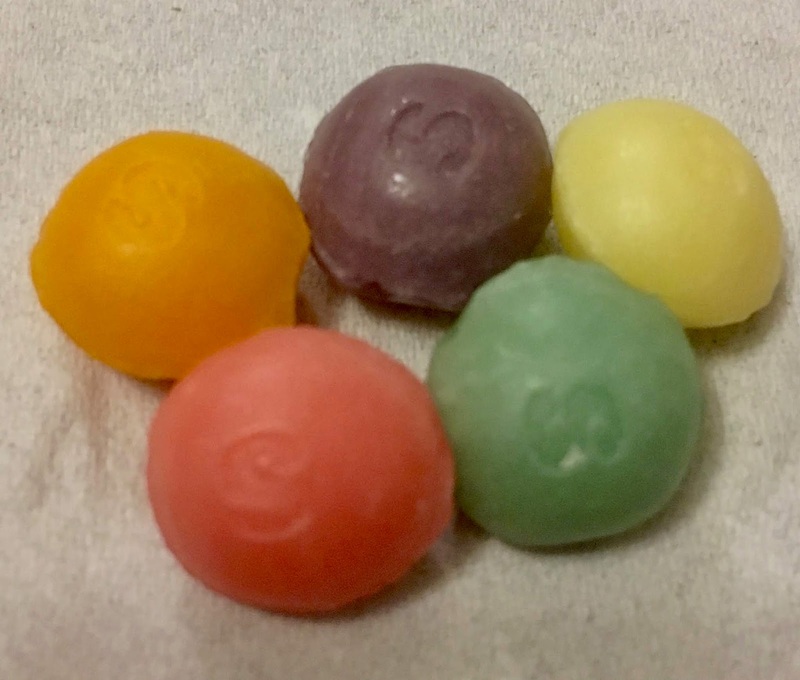 I guess it also depends how old your teeth are, as I used to be able to eat seaside Rock and Tutti Frutti with impunity, I just hope I don't get to the stage were I have to miss out on Skittles Shells! 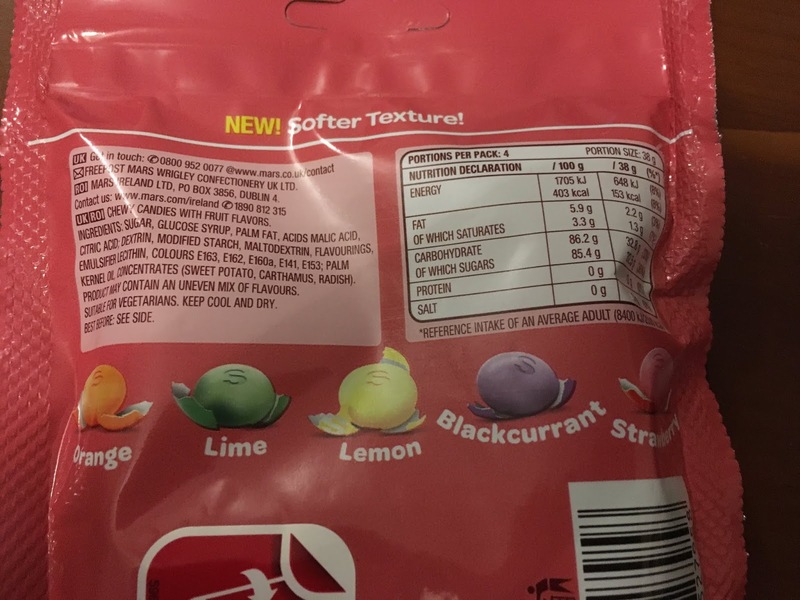 The 152g packet has 153 calories per 38g serving, with 2.2g of fat, 32.5g of sugar, and 0g of salt. The ingredients are suitable for vegetarians, so please see photograph. I saw Skittles Spicy (or something like that) in Sainsbury's just now - they have a kick at the end of the chew apparently!